Learn about the issues that arise for collaboration in theatre or performance productions with Own It, the intellectual property service. Working, producing, collaborating and performing in the theatre brings about a whole wealth of copyright and intellectual property issues whether the work is yours, someone else's or a combination of both. 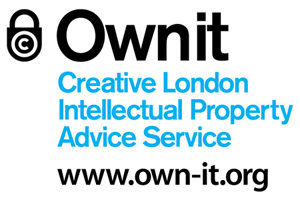 Own It, www.own-it.org, the intellectual property advice service for London's creative businesses, invites you to learn about these issues and the intellectual property rights involved in any kind of collaboration in theatre or performance. This Own It and Stellar Network event is for creatives, writers, performers, musicians and artists, and will offer a basic guide to the IP issues that affect those working in the theatre and performance industry. Guest speakers will include Greg Ripley-Duggan, Executive Producer at Shakespeare's Globe and Sean Egan, IP lawyer, specialising in film and theatre, from Bates Wells & Braithwaite.